Mathematical Morphology allows for the analysis and processing of geometrical structures using techniques based on the fields of set theory, lattice theory, topology, and random functions. It is the basis of morphological image processing, and finds applications in fields including digital image processing (DSP), as well as areas for graphs, surface meshes, solids, and other spatial structures. This book presents an up-to-date treatment of mathematical morphology, based on the three pillars that made it an important field of theoretical work and practical application: a solid theoretical foundation, a large body of applications and an efficient implementation. Part I sets out the fundamental aspects of the discipline, starting with a general introduction, followed by two more theory-focused chapters, one addressing its mathematical structure and including an updated formalism, which is the result of several decades of work. Part II extends this formalism to some non-deterministic aspects of the theory, in particular detailing links with other disciplines such as stereology, geostatistics and fuzzy logic. Part III addresses the theory of morphological filtering and segmentation, featuring modern connected approaches, from both theoretical and practical aspects. 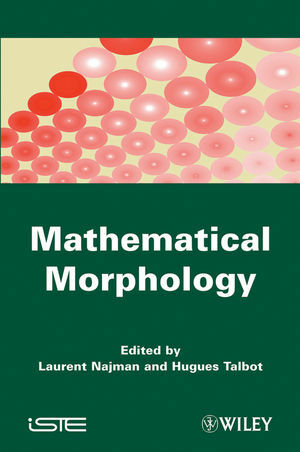 Part IV features practical aspects of mathematical morphology, in particular how to deal with color and multivariate data, links to discrete geometry and topology, and some algorithmic aspects; without which applications would be impossible. Part V showcases all the previously noted fields of work through a sample of interesting, representative and varied applications. Laurent Najman is Professor in the Informatics Department of ESIEE, Paris and a member of the Institut Gaspard Monge, Paris-Est Marne-la-Vallée University in France. His current research interest is discrete mathematical morphology. Hugues Talbot is Associate Professor at ESIEE, Paris, France. His research interests include mathematical morphology, image segmentation, thin feature analysis, texture analysis, discrete and continuous optimization and associated algorithms.